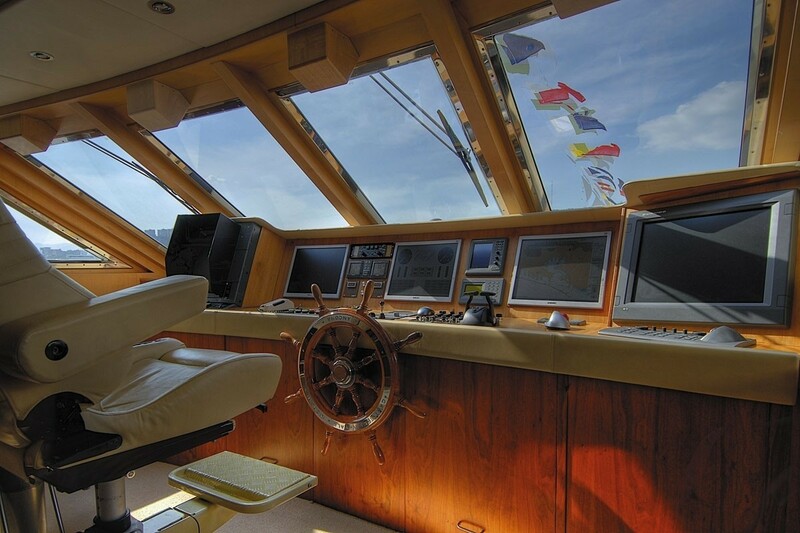 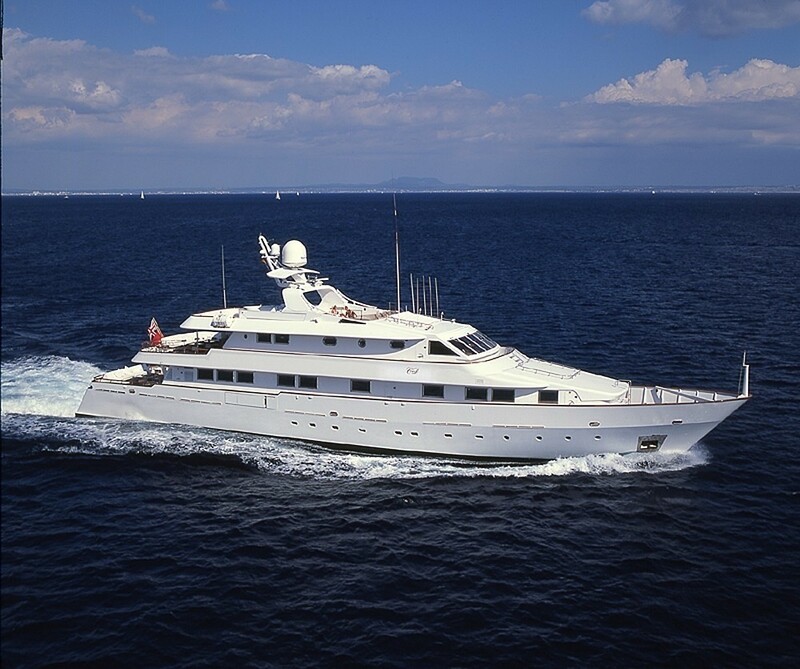 Motor Yacht CD TWO is a luxury yacht built by Nicolini yachts in 1995, having had an extensive refit in 2008. 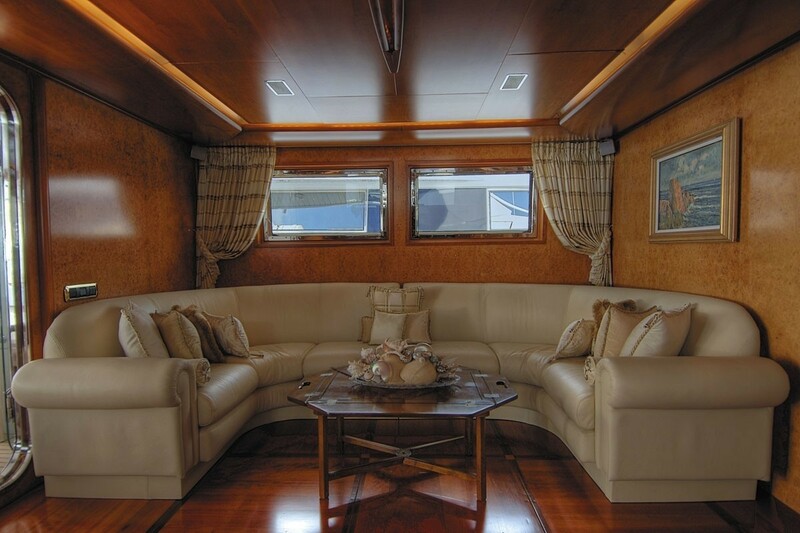 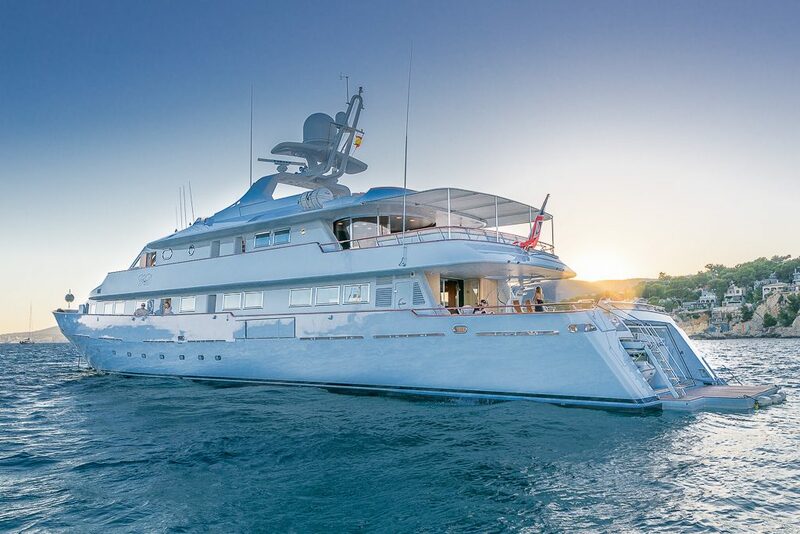 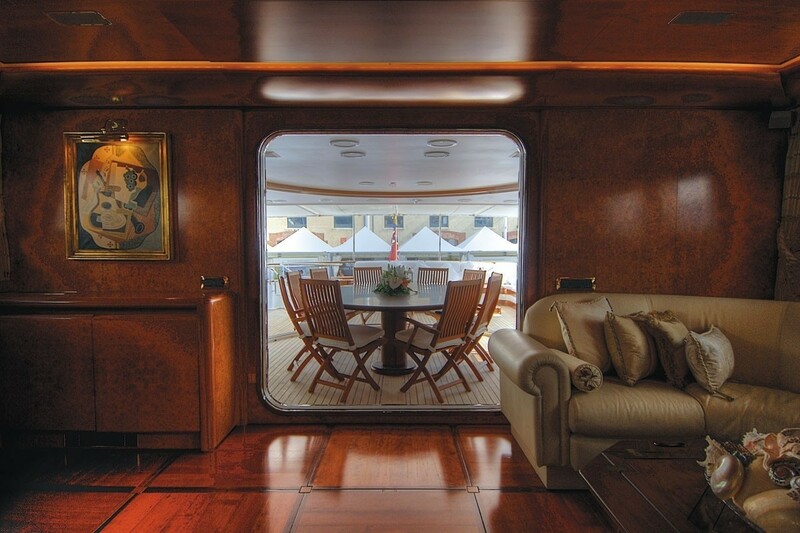 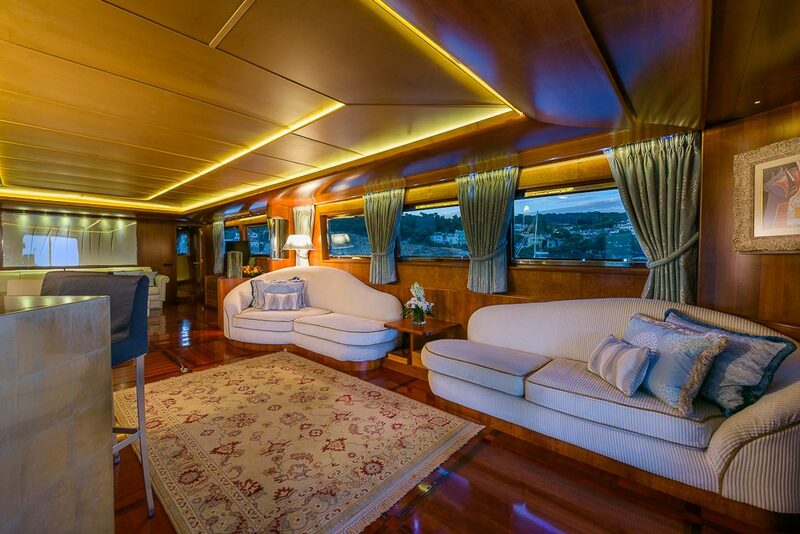 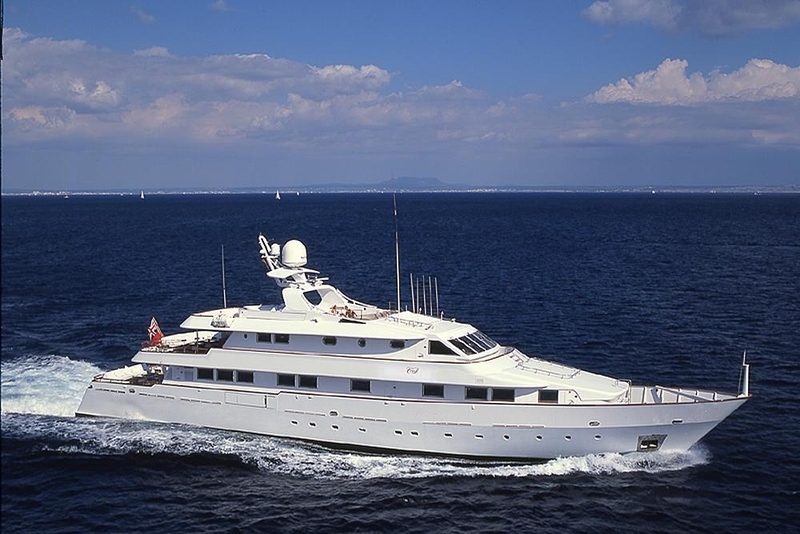 CD TWO measures 43m (141 feet) in length, and can accommodate up to 13 guests in 7 cabins. 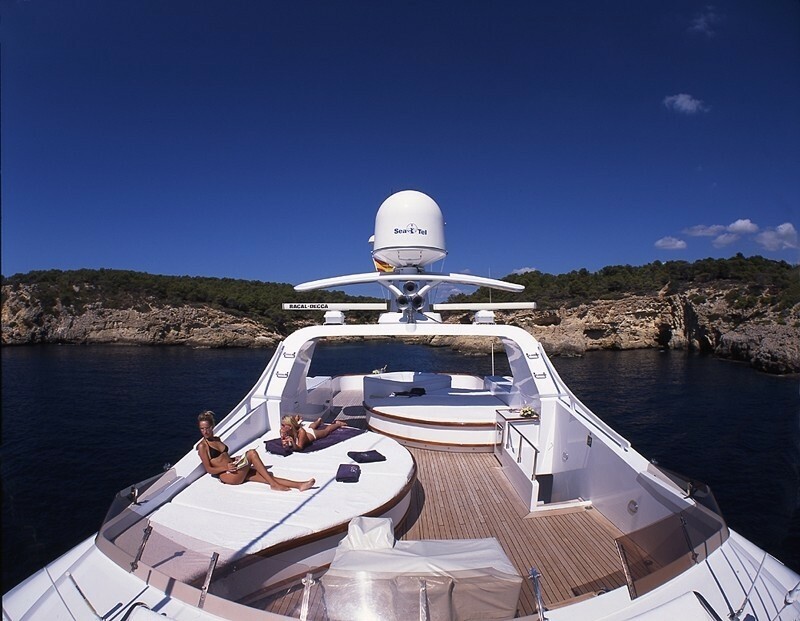 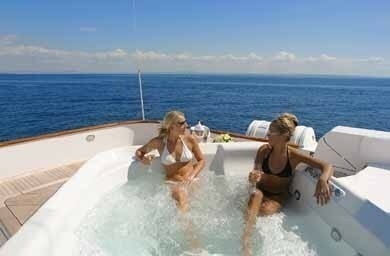 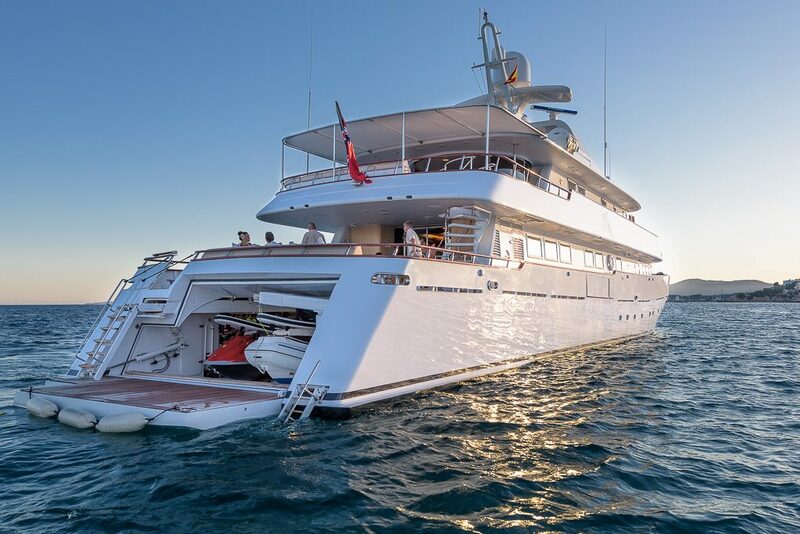 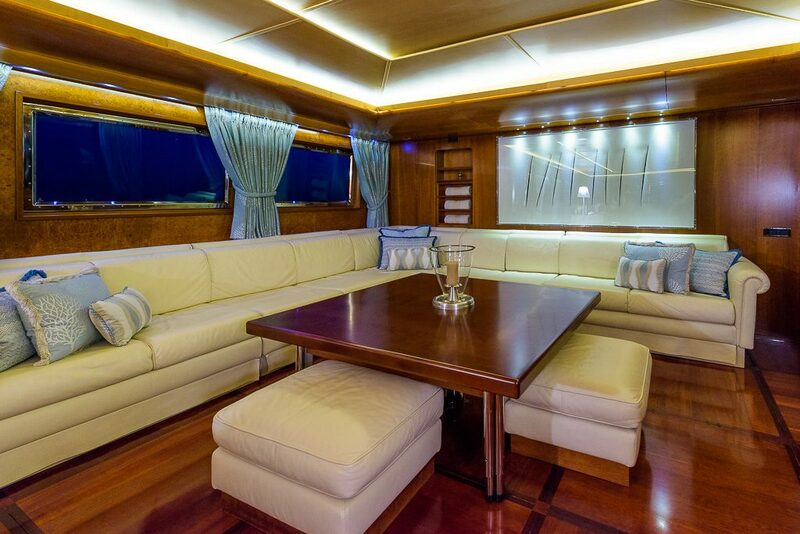 She is well equipped for luxury charter with air conditioning throughout. 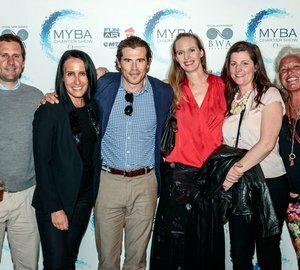 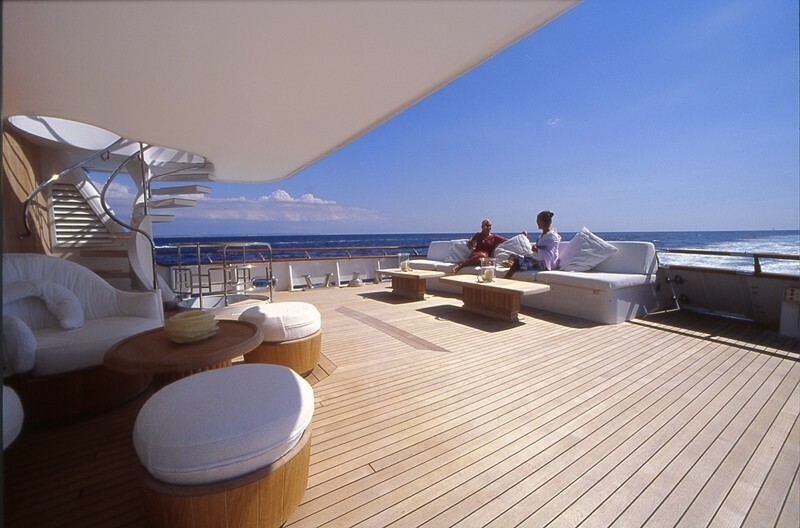 A crew of nine offers impeccable onboard luxury service. 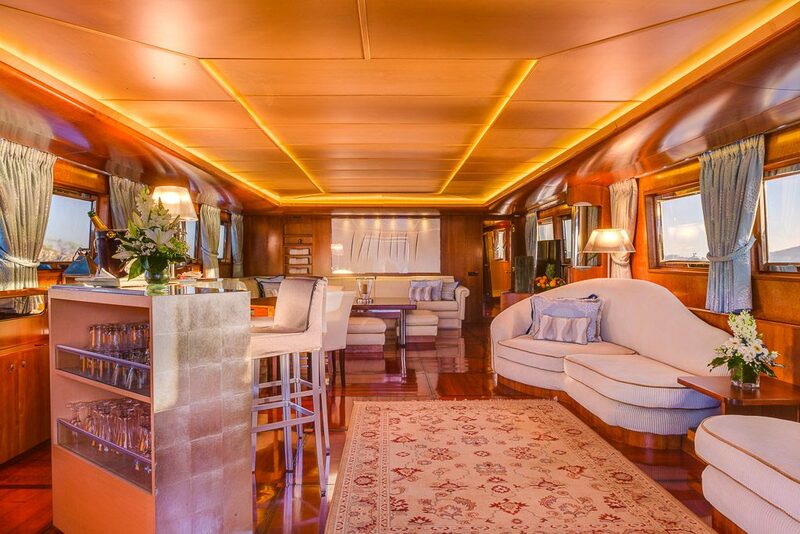 CD TWO has a classic and elegant interior with high gloss wood floors and panelling in the salon and sky lounge, with a good range of eclectic artworks giving this charming yacht some individuality and character. 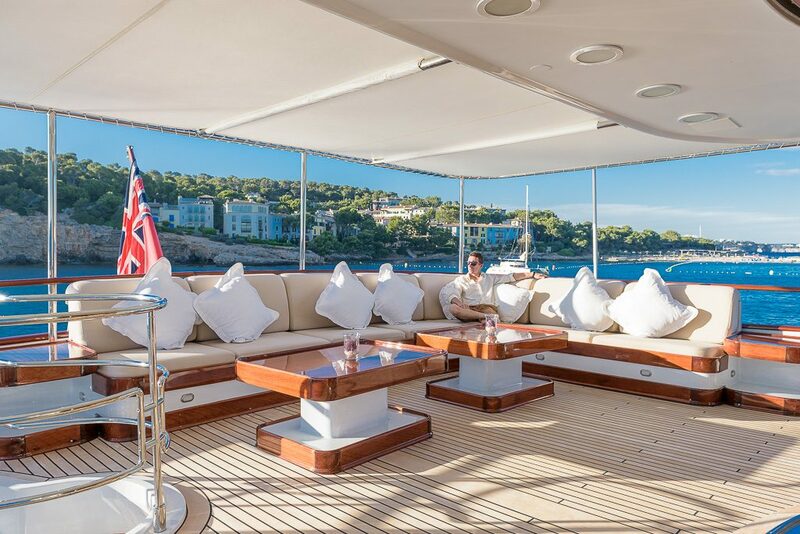 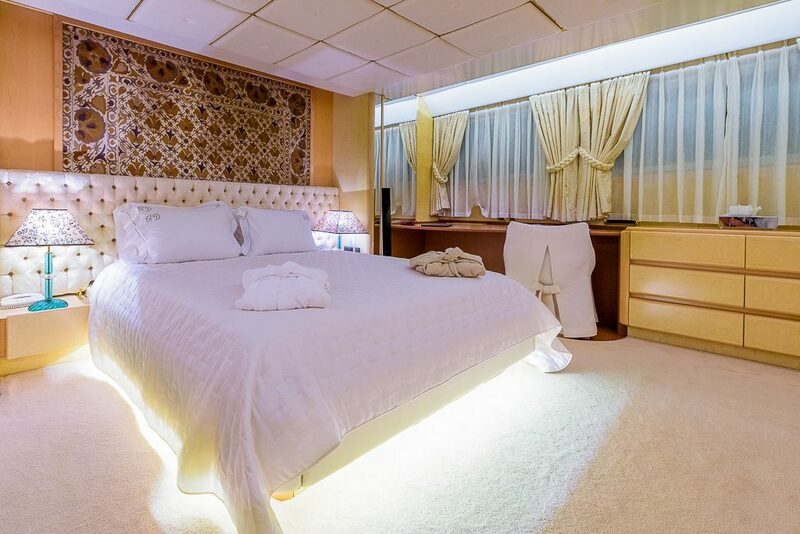 She has a comfortable main salon with polished floors, cream sofas and chairs, an attractive bar, with a further sky lounge on the upper deck for pre and post-dinner drinks, or simply to relax and a separate dining area on the upper deck aft. 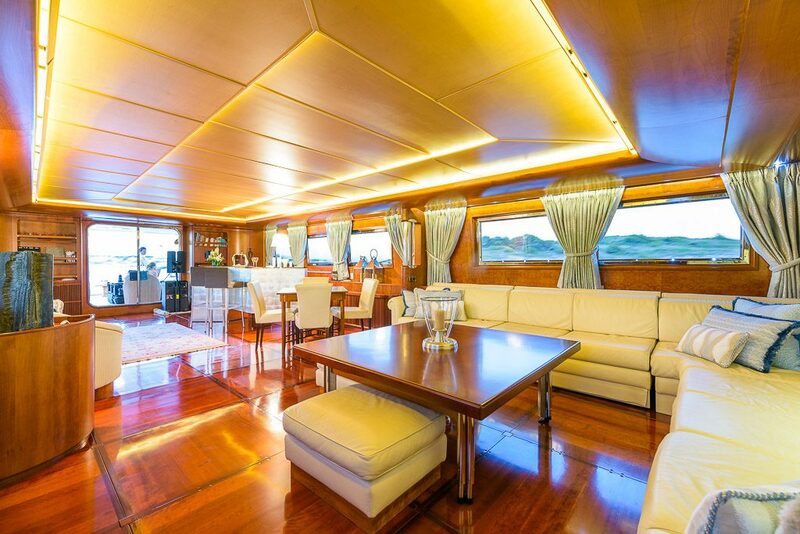 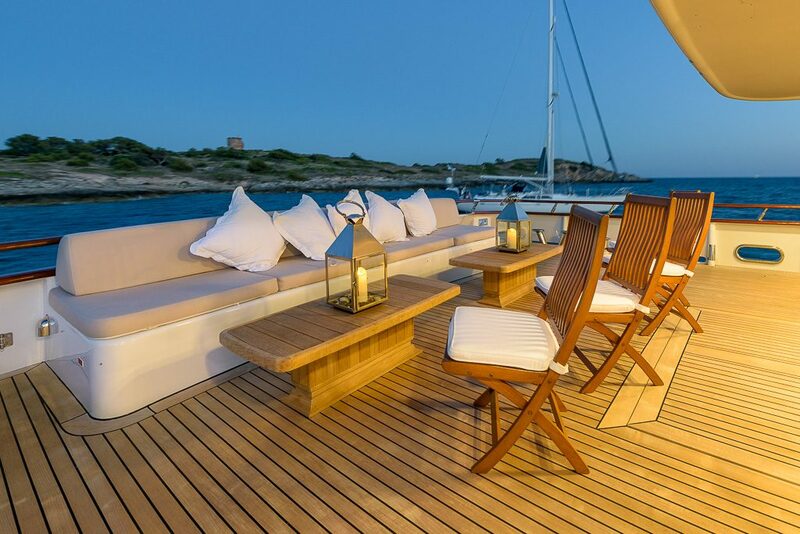 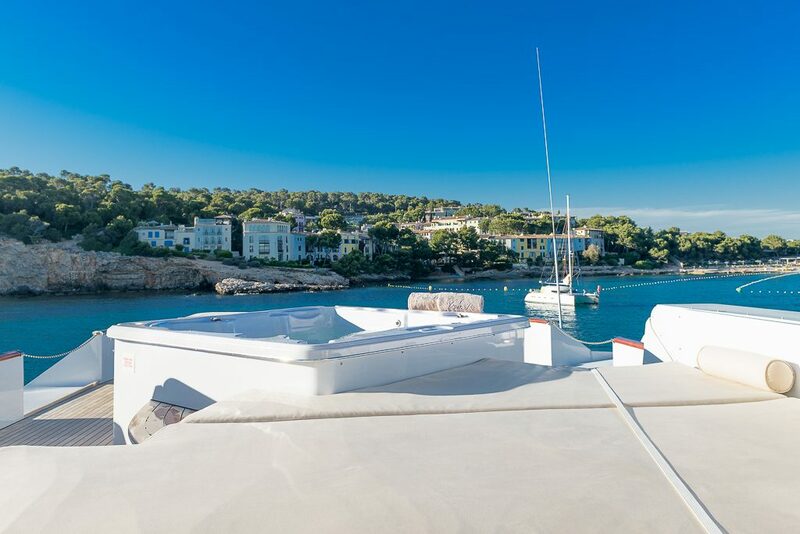 This yacht has a good range of deck space for you to enjoy, with a comfortable seating area aft on the main deck, and further seating and a dining area aft on the upper deck, where you can enjoy the great cuisine alfresco. 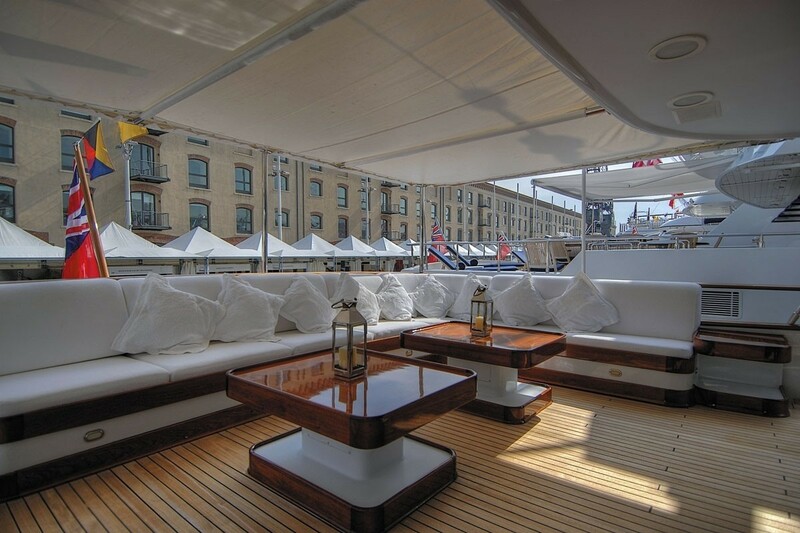 Luxury yacht CD TWO also has a well laid out sun deck with ample seating and sun pads for taking some sun and a bubbling Spa Pool where you can sip on a cocktail and take in the view. 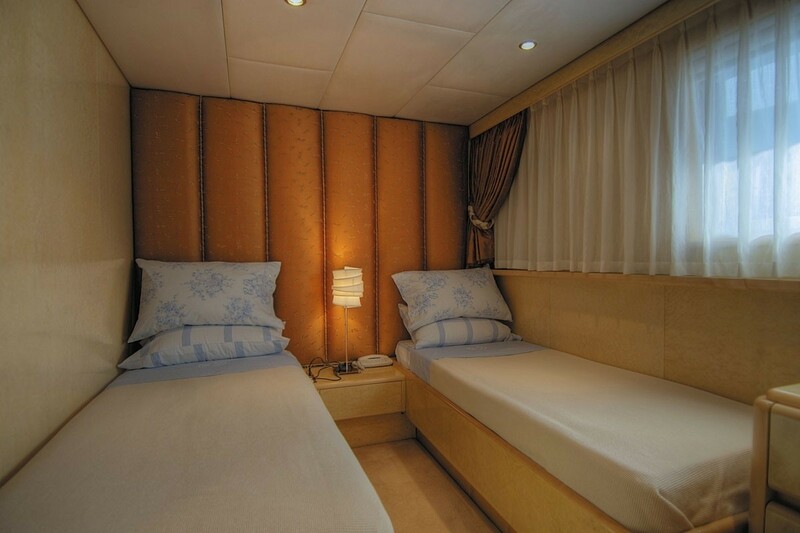 CD TWO is equipped with all your audio visual needs, including WiFi / Internet, TV, DVD and CD players. 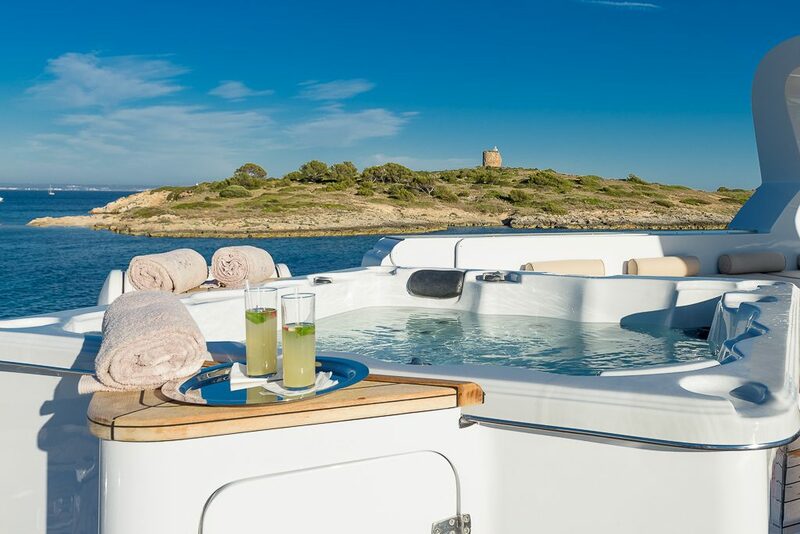 If water sports are of interest, there is a great range of activities including a Stinger 6.2m RIB with 140 hp outboard, an Avion Cherokee 4.85m RIB with 75 hp outboard, a Yamaha Waverunner, a Yamaha Jet Ski, Jet Ski Water Skis, a variety of Towable Toys, Snorkeling Gear, Dive Gear and Bauer Diving Compressor - Rendez-vous diving is available by appointment. 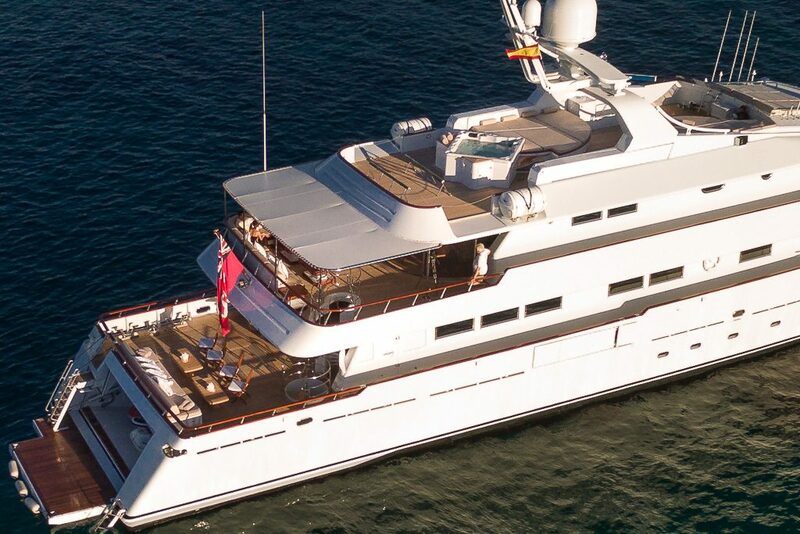 She measures 43m (141 feet) in length with a beam of 7.6m (24.9 feet) and a draft of 2.52m (8.26 feet). 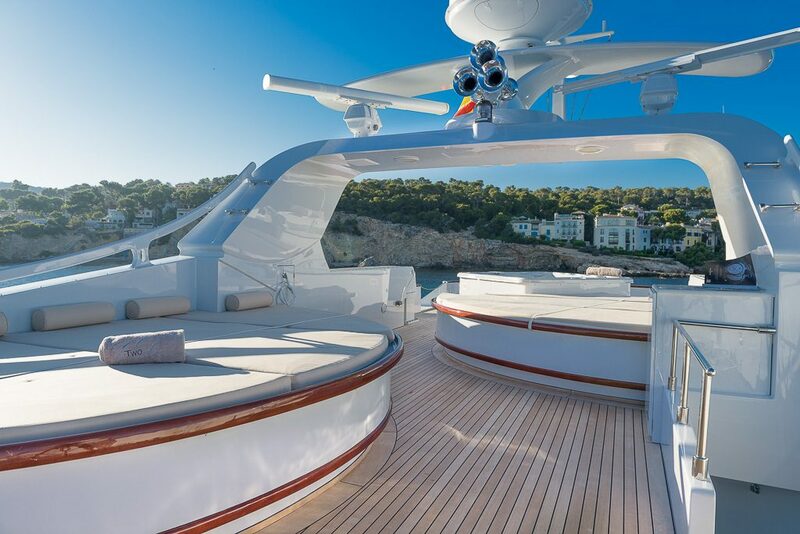 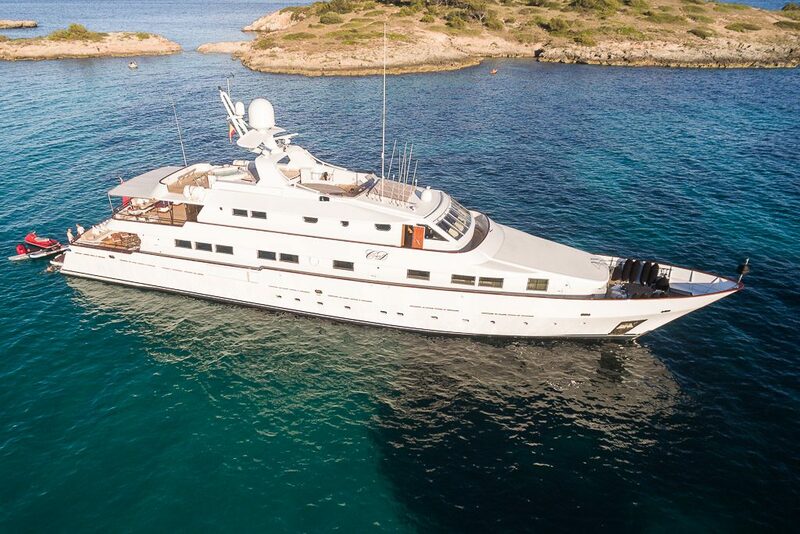 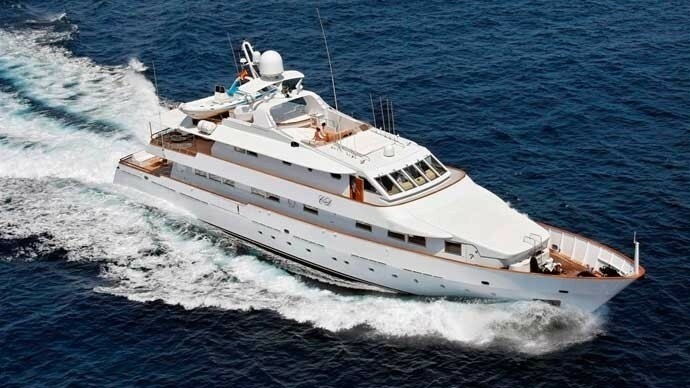 Motor yacht CD TWO has nine crew and cruises at an average speed of 14 knots. 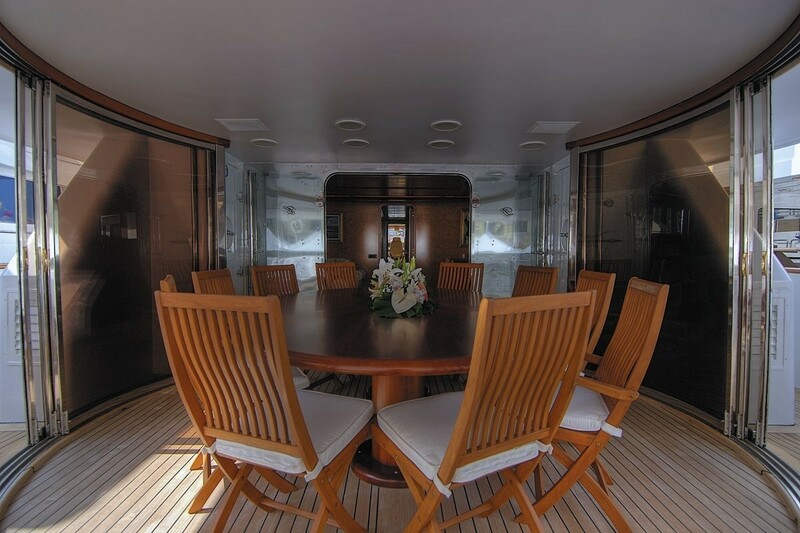 The CD TWO yacht is able to accommodate up to 13 charter guests in 7 cabins including a master cabin located forward on the main deck. 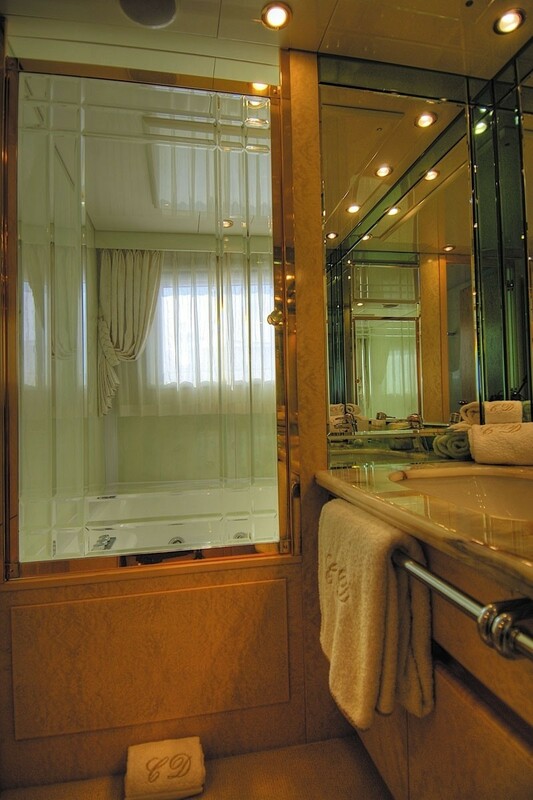 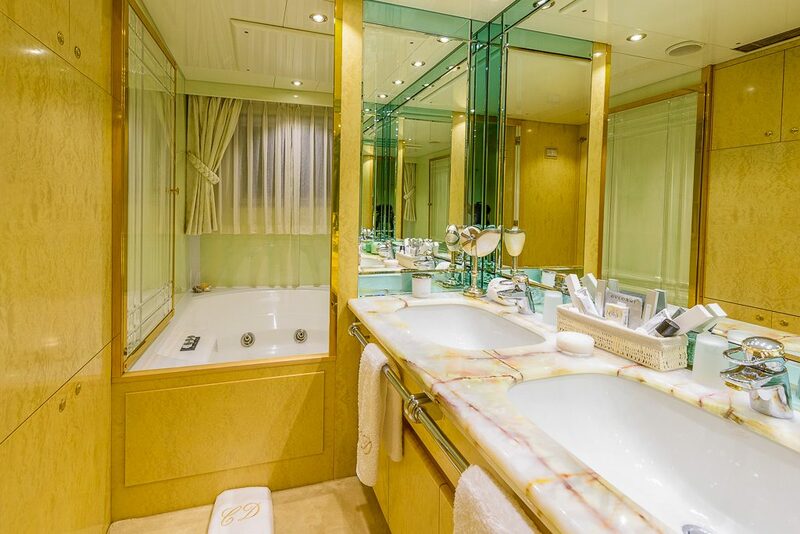 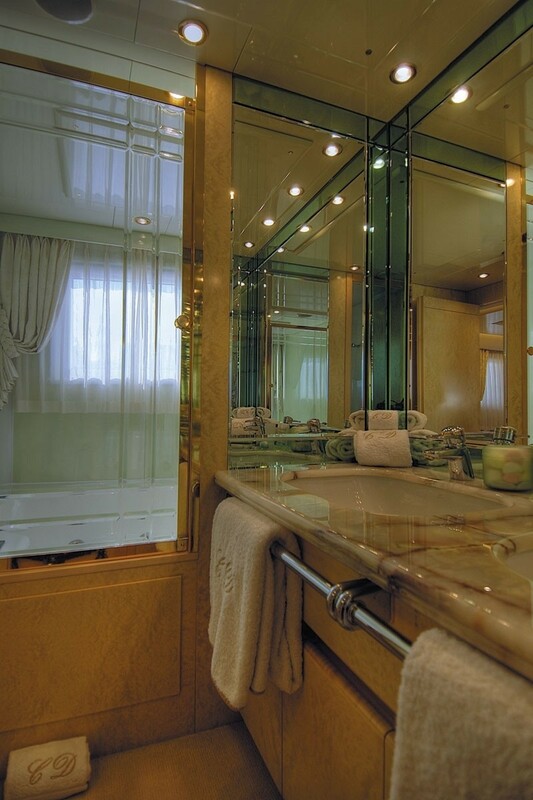 The full-width Owners suite has a large bathroom, Spa Pool tub and shower, TV, VCR, DVD. 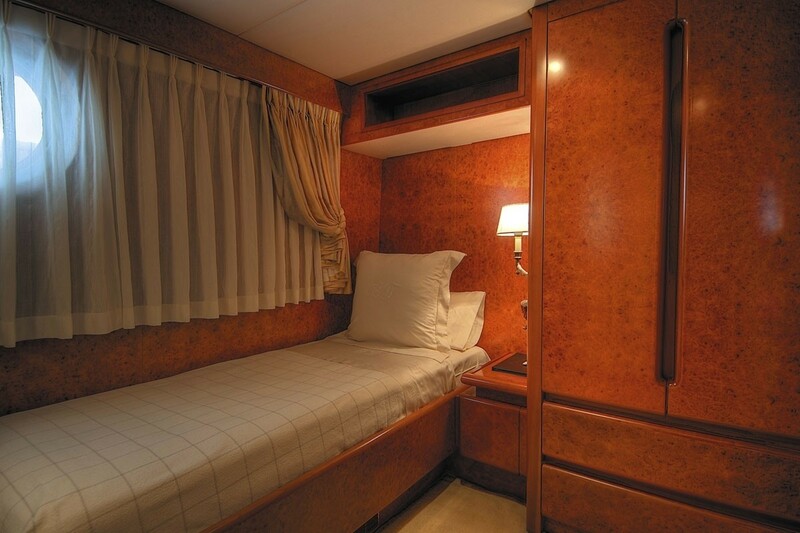 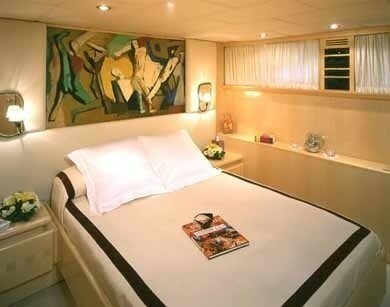 Adjoining this is the first of the three twin cabins with en-suite shower and toilet, TV, VCR. 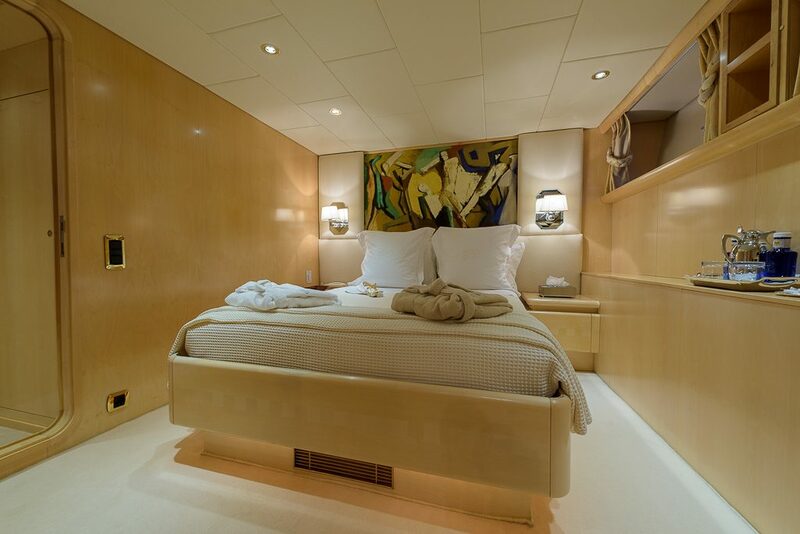 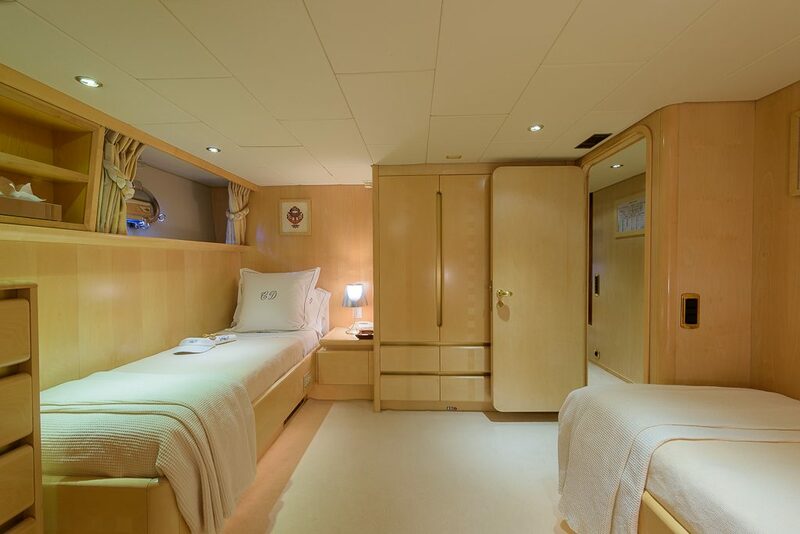 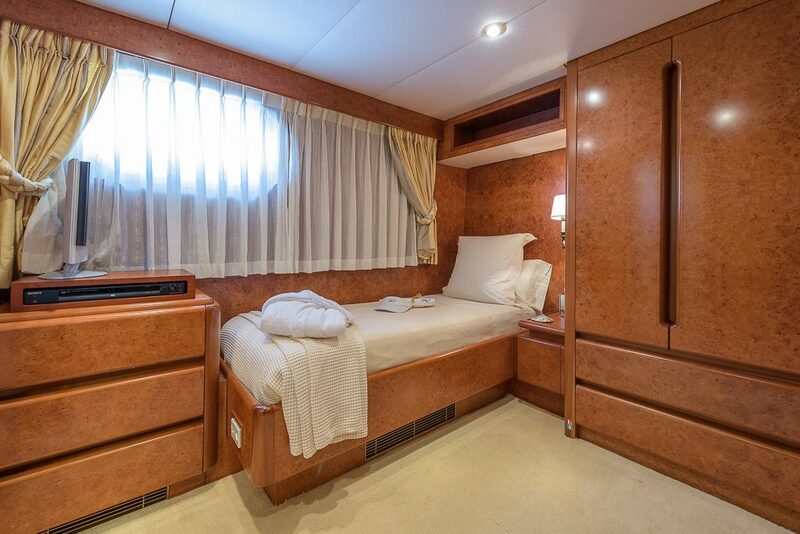 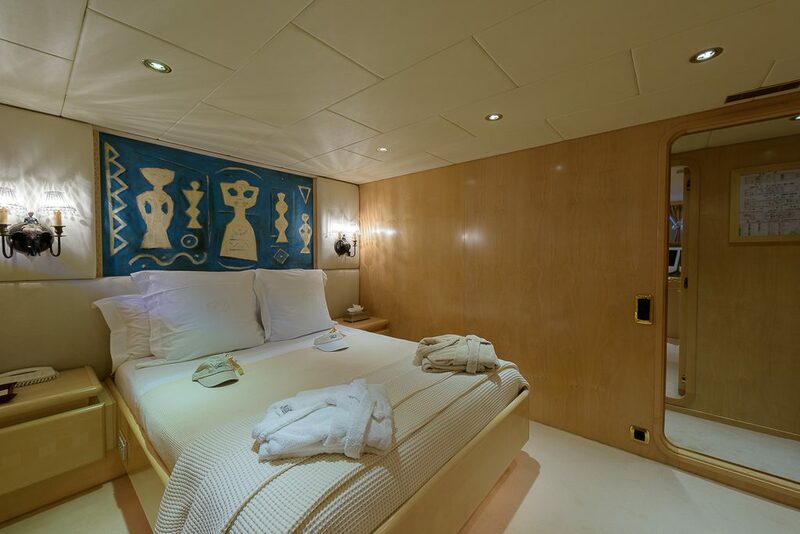 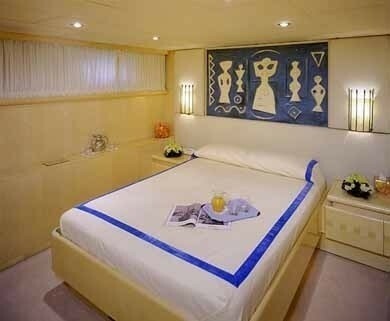 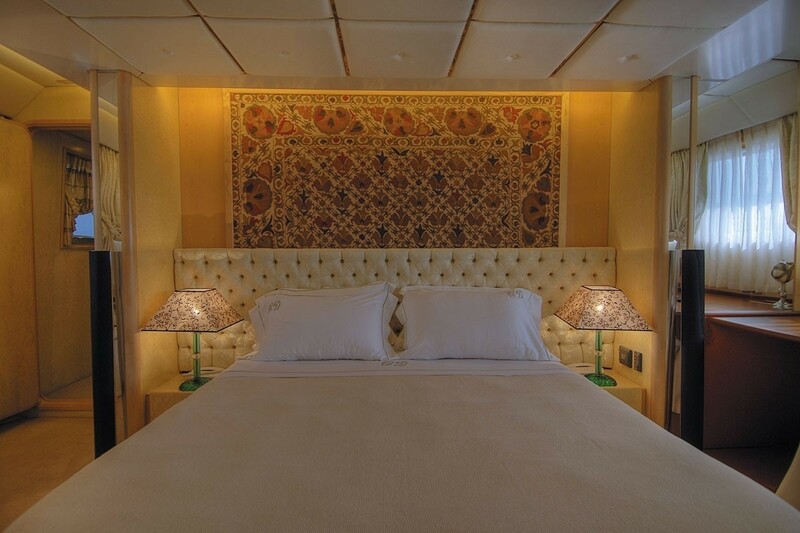 On the lower deck, there are two equal sized double cabins with full amenities as well as the remaining two twin cabins which due to their head to toe arrangement offer excellent space. 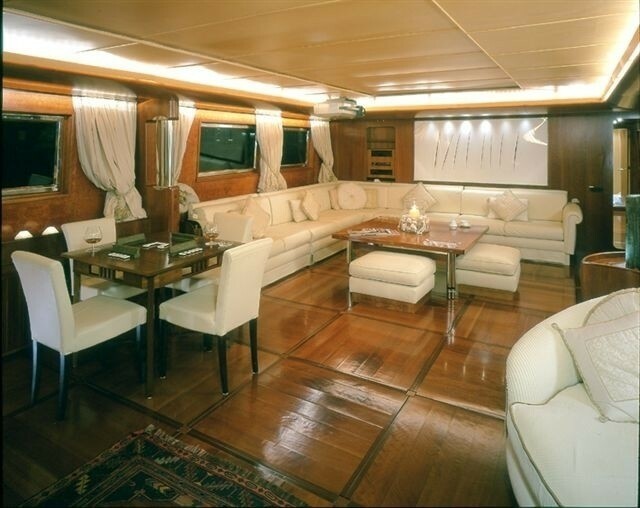 On the upper deck, there is a single cabin.